Join us tomorrow for our special family-friendly Good Friday worship at 12pm here at Advent. 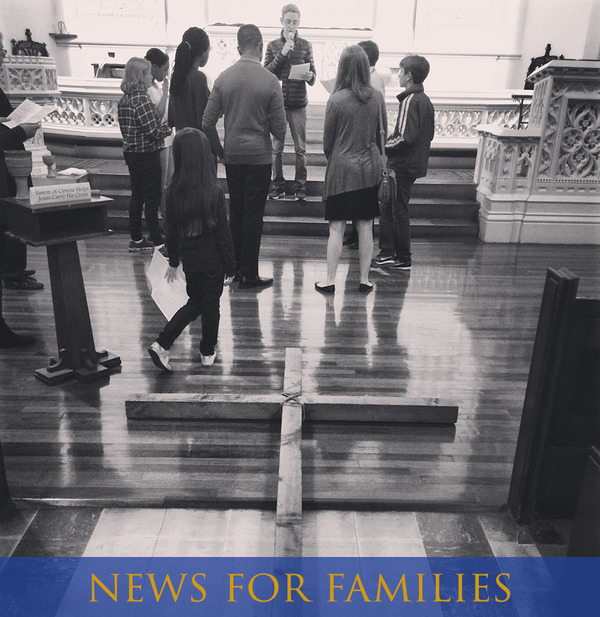 We've sought to blend tradition and a kid's perspective in a Stations of the Cross activity that is both kid-friendly and meaningful for adults. The worship service will take children and adults through a variety of sensory activities matching the unfolding story of the Good Friday scripture. Come join us! Let's create a happy, fun place for congregants and visitors to enjoy breakfast together this Easter Sunday! Youth and families who signed up to help: Thank you for stepping up to serve the congregation and encourage their support of youth ministry here at Advent. A reminder that we'll be meeting in the kitchen downstairs, the first shift is from 8:30am-10:50am, and the second shift is from 10:10am-12:30pm. We'll be preparing food in the kitchen, serving food in the basement fellowship hall, and creating a welcoming and fun atmosphere for all who join us. See you Sunday! And to our younger families, you're invited to come dine at our Easter Breakfast anytime between 10am-12:30pm this Sunday! Come see what you have to look forward to when your young ones are in high school, and support the program that will one day be theirs. The date and time of our next Confirmation Class has changed to enable everyone to participate. It will now be next Friday, April 21 from 7-9:30pm. It will still be at the home of the Richards family. Please note that our start time is later than usual.